LANDOVER, Md. — Navy coach Ken Niumatalolo almost lost faith in his kicker Jon Teague eight games into what proved to be a disappointing season for the Midshipmen. He stuck with his senior, even though he had held a kicking competition in practice Oct. 31 between Teague and the team’s three other kickers on the roster. Niumatalolo said he’s glad he stuck with Teague after the senior kicked two clutch field goals, including a 44-yarder, to beat Army 27-21 for Navy’s unprecedented 10th straight victory against Army in the 112th meeting of the two service academies. Tears dripped down Niumatalolo’s cheeks when reporters asked him after the game about the struggles Teague had earlier in the season. Navy’s seniors echoed their coach’s support. Senior fullback Alexander Teich said Teague perfectly represented their team this season. 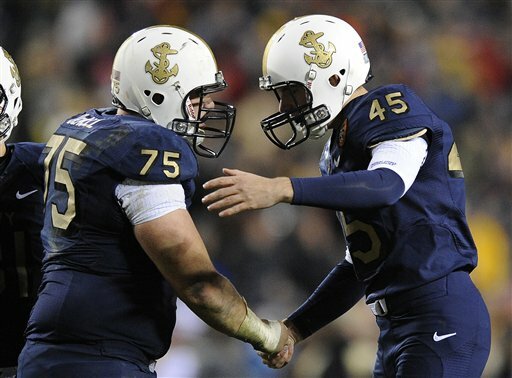 Although they struggled through a 6-game losing streak, Navy’s seniors fought off an improved Army team to win the most important game of the year for either team. President Obama and Vice President Joe Biden joined Defense Secretary Leon Panetta in what proved to be the rivalry’s best game of the past ten years. An announced crowd of 80,789 at FedEx Field joined the president for the first Army-Navy game to be played in the Washington D.C. region.